My shelf runneth over with great books to tell you about. 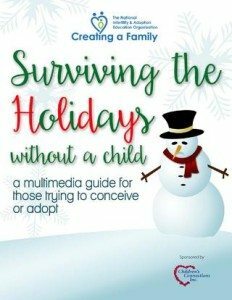 Guide to Surviving the Holidays Without a Child, an e-booklet from Creating a Family, is a timely read for many. At no other time of year do we emphasize “family” the way we do in November and December. When you’re in the throes of family-building, it can be so tough you want to crawl under a rock until January 2. This free pdf download will help get you through, maybe even with a few chuckles. 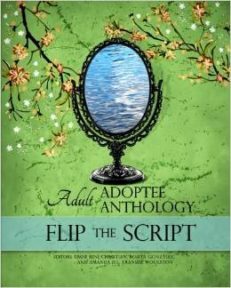 Flip the Script Adult Adoptee Anthology. You’ve been hearing about the #flipthescript movement for weeks now, adoptees grabbing the mic and flipping the script during November, National Adoption Awareness Month. Editors Diane Christian, Rosita Gonzalez, and Amanda H.L. Transue-Woolston have compiled 47 essays, poems and artistic renderings of what it feels like to be an adopted person. Each one makes me think. And feel. 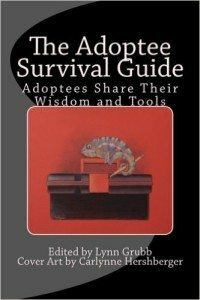 Along similar lines is The Adoptee Survival Guide: Adoptees Share Their Wisdom and Tools, edited by my friend Lynn Grubb. For adoptive parents like me, reading is like being a fly on the wall of a conversation my kids might one day participate in among their adoptee peers. Whether you’re parenting an adoptee who knows his/her birth parents, who wonders about his/her birth parents, or who never mentions his/her birth parents, you’ll find something useful in this book. SO many excellent and engaging essays here. 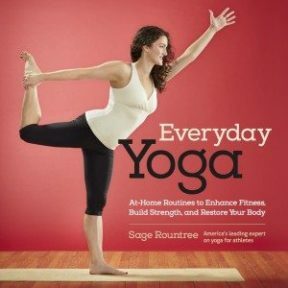 Last is Everyday Yoga by Sage Rountree. It’s helping me understand more about yoga sequencing so that I can feel confident leading myself through yoga practice at home. I love that the book is spiral-bound and easy to consult. It’s comprehensive, too, and I can build in a little bit of everything — for strength, to maintain flexibility, to calm my body and mind, to work on balance. The book suggests warm-ups, cool-downs, standing series, sitting series, lying-down series, and has ways to make poses “spicier” (ratchet up) or “sweeter” (ratchet down). It’s heavy on pictures — helpful for visual folks like me. Disclosure: all books were given to me to review. What’s in your reading stack these days? All of these sound like great suggestions! Will have to check them out. Currently reading lots of fiction. The Grass Dancer by Susan Power, which has so many themes surrounding the definition of family. Just finished Banquet of Consequences by Elizabeth George (my advisor passed her copy on to me), which also really explores this theme.